A: 3:00 - 4:10 "Favorite Moves with Eye-Catching Moments"
Setting up moves to get flow "out of nowhere". It's like magic! B: 4:20 - 5:30 "Dynamic Cross-Step Variations"
C: 5:40 - 6:50 "Instructor's Favorites"
There is plenty of parking available on the street or in the adjoining lot. Registration opens at 2:40pm. Come early to sign in, change shoes, stretch, warm up, etc. Pre-registration is highly encouraged to maintain lead/follow balance. You can pay online by Visa or PayPal. Cash or check at the door only, please. 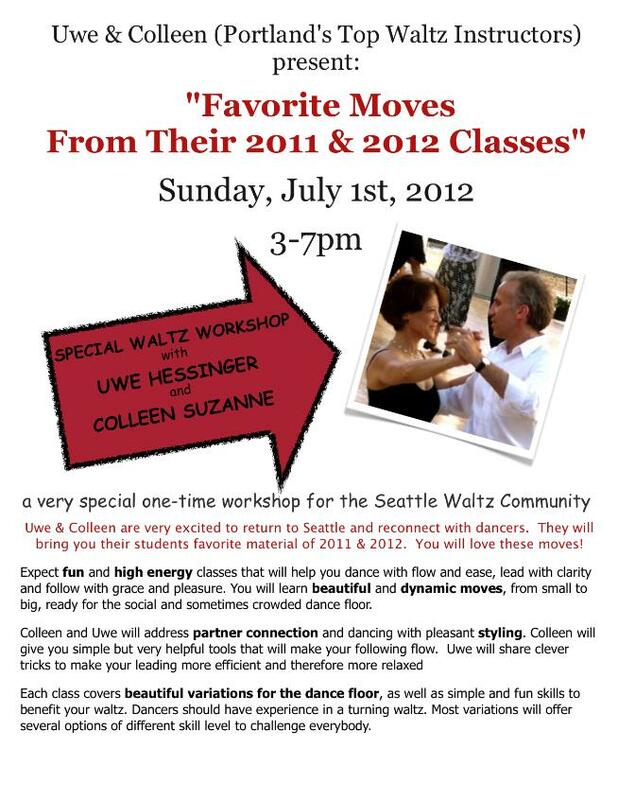 We are very much looking forward to coming up to Seattle and bringing our favorite waltz material to you. We think that you will enjoy the moves and will find tips on some technique and styling helpful and fun. Here is list of variations and related fundamentals which we are bringing up for you.